Are you looking for places in Greater Palm Springs to take that special person in your life? Maybe it&apos;s your first date and you&apos;re trying to impress them with a romantic date. Or it could be your millionth date and you want to try something new. Whether it&apos;s a new or existing relationship, romance fills the air in Greater Palm Springs and there are plenty of date ideas that will have you and your date feeling connected. From breathtaking views to relaxing spa days, through adventures from high above the land and those that take place in the kitchen, the oasis has an experience waiting for you and your significant other. 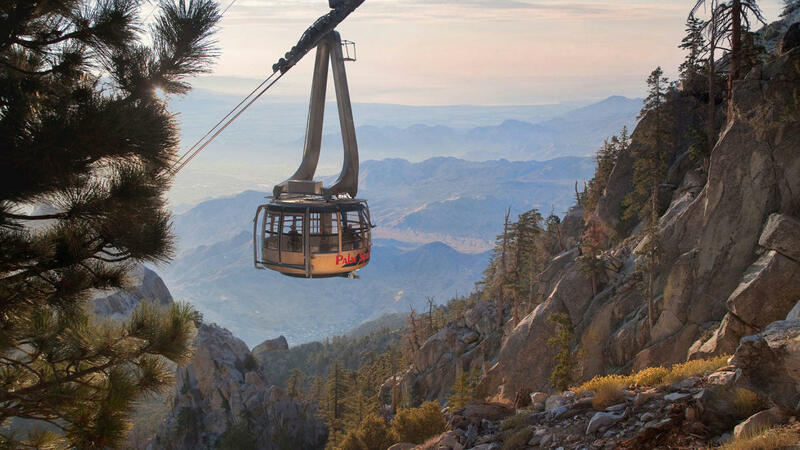 NOTE: The Palm Springs Aerial Tram is temporarily closed due to weather damage. Many travel from afar to ride in the world&apos;s largest rotating cart all the way up to an elevation of 8,516 ft. above sea level. Not only is the ride majestic with unbelievable views of Palm Springs, but the feeling of floating is quite exhilarating. Once at the top, you have two dining options: Peaks, fine dining with a view and Pines Café, a cafeteria-style restaurant. If you&apos;re looking to explore, the Tramway has over 50 miles of hiking. More activities include camping, guided nature walks, snow skiing and more. Get lost in love at the top of Greater Palm Springs. The oasis is known as an escape for relaxing and rejuvenating with its array of resorts and spas. Whether it&apos;s a couples massage or enjoying a spa day, up your date night with a one-of-a-kind experience that will help you both feel your best. The Spring Day Spa lets guest choose from soaking in three different mineral pools while enjoying the soothing oasis ambiance. Or experience holistic healing at the Ritz-Carlton, Rancho Mirage, where couples can indulge in a luxurious massage with a view. If you&apos;re looking for time to stand still, check out the Spa Desert Springs at JW Marriott Desert Springs Resort & Spa, where all the focus is on you and your loved one at this 38,000 square-foot spa facility. Or get immersed in rejuvenation at Spa La Quinta at La Quinta Resort & Club with their various options on body renewal techniques. Want to surround yourselves with scenic mountain views? Try the Well Spa at Miramonte Indian Wells Resort & Spa. Bonus tip: You can find more romantic spa options in Greater Palm Springs on our Spa Experience page. Enjoy a taste of nostalgia with a date shake at the famous Shields Date Garden in Indio. This is the perfect date for anyone looking to satisfy their sweet tooth. Not only is it a staple for dates in Greater Palm Springs, but this spot is also a romantic oasis filled with beautiful palm tree views. You&apos;ll both feel like you found your own mini oasis while indulging in an iconic date shake. Cooking with Class offers numerous cooking classes taught by professionals. This educational workshop welcomes all experience levels and puts an emphasis on having fun. What better way to impress your date than to show off your cooking skills or learn a new dish for your next date. Soar to new heights with your special person by taking a ride on a hot air balloon to enjoy the beautiful and majestic view of the oasis. 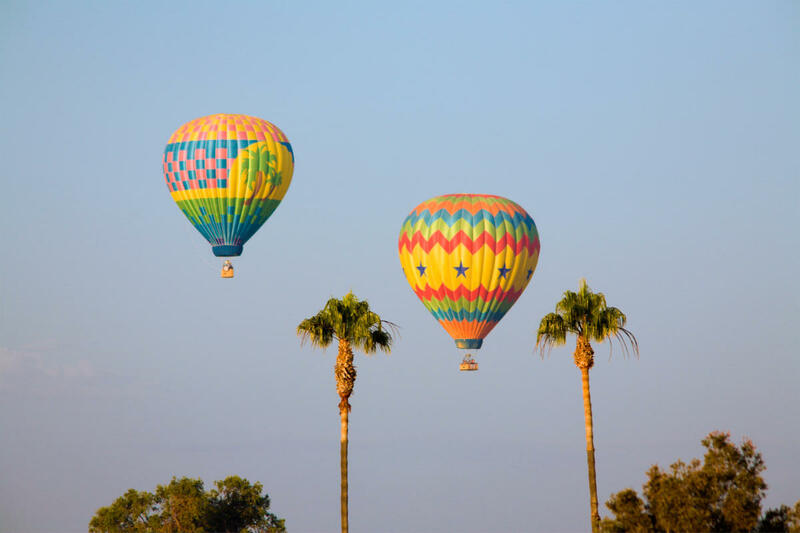 A few companies in Greater Palm Springs offer hot air balloon rides, including Magical Adventure Balloon Rides, Fantasy Balloon Flights and Balloons Above. It&apos;s written in the stars that you must visit the Rancho Mirage Observatory. This is the only observatory in Greater Palm Springs where you can get a glimpse of something out of this world. Check out more info on stargazing at the Rancho Mirage Observatory here. Set the mood and indulge in fine dining in Greater Palm Springs, where there are endless options to wow your date. If you&apos;re looking for a quality steak, reserve your table at The Steakhouse at Agua Caliente Resort Casino Spa Rancho Mirage. For rooftop snuggles, get cozy with fireside dinner and drinks at Azucar at La Serena Villas, or enjoy the view at the rooftop bar at The Kimpton Rowan in Palm Springs. If you&apos;re looking for a lively dinner date, make sure to check out The Nest, or Melvyn&apos;s where you can expect to be dancing after dinner. Or take your dinner date to the next level with lakeside views at Mélange at The Chateau at Lake La Quinta. Want to keep things sweet and simple? 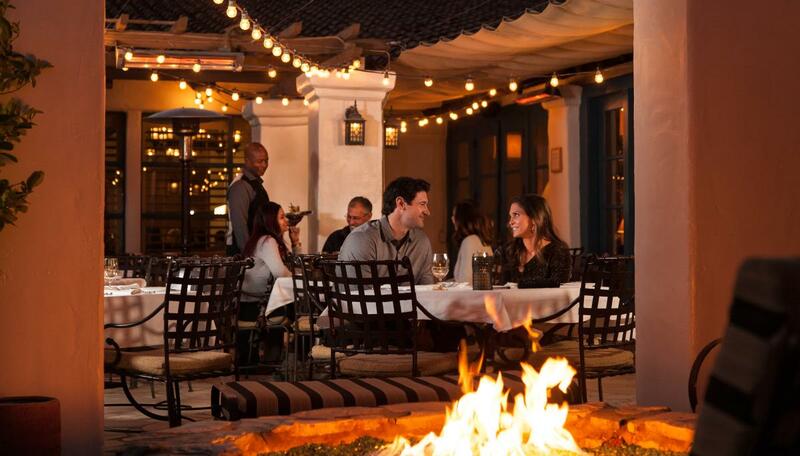 Dine under romantic outdoor lights at Spencer&apos;s, Le Vallauris, or Copley&apos;s. There are plenty of amazing restaurants in Greater Palm Springs to impress your sweetheart, and you can save on your night out by taking advantage of our dining deals. Wander hand in hand as you explore this beautiful 1,200-acre zoo filled with wild animals from deserts all over the world. Why not make it an unforgettable experience by feeding giraffes, riding camels and getting close to lorikeets. The Living Desert is a perfect date location for any animal lover! Hike stunning view of the canyons, desert mountains and oasis terrains with your date on some of these top hiking experiences in Greater Palm Springs. If you and your sweetheart are looking for more simple strolls, these nine scenic and simple hikes have your covered. 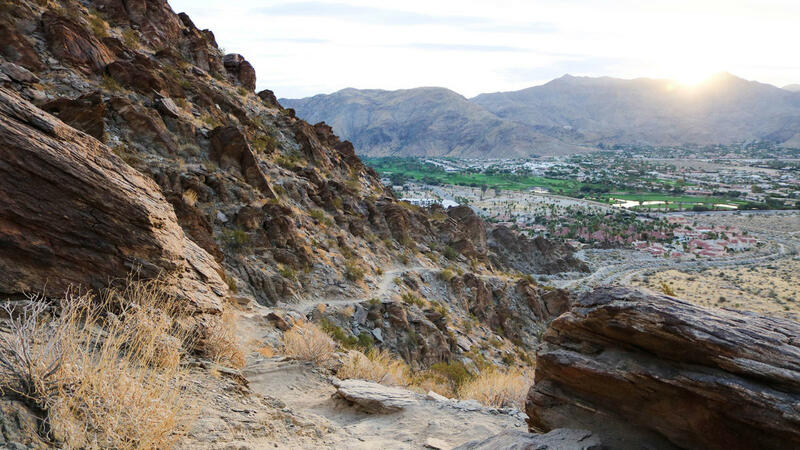 If you and your date are looking for more challenging hikes, don&apos;t miss these 10 trails in Greater Palm Springs that will get you into shape. Whichever hike you choose, you&apos;ll find that every single one is absolutely perfect when you&apos;re hiking together. Want to set the tone for a great first kiss? Drive up to Vista Point in Palm Desert to overlook the oasis, or take your date to The Ritz-Carlton for a gorgeous view that will surely impress. Another romantic option is a picnic by the pond at Palm Desert&apos;s Civic Center Park, where you can feed ducks and enjoy a stroll. For more vistas, check out these five picks. Why not dance the night away with your date? Head to LIT at Fantasy Springs Resort Casino for gambling, drinks and live music. Or if you&apos;re in Palm Springs and looking for the same ambiance, check out Cascade Lounge at Agua Caliente Casino Palm Springs. While in downtown Palm Springs, a few options to consider include Village Pub Bar & Grill, High Bar at Kimpton Rowan Palm Springs Hotel and Moxie Palm Springs. Greater Palm Springs is filled with rich art. Get your art action on with everything from incredible street murals in Coachella to exquisite exhibits at the Palm Springs Art Museum. Take a tour during Modernism Week to learn about the desert modernism culture or explore beautiful installations in the oasis during Desert X. Looking for more ways to plan the perfect date night? Check out these romantic boutique hotels in Palm Springs!